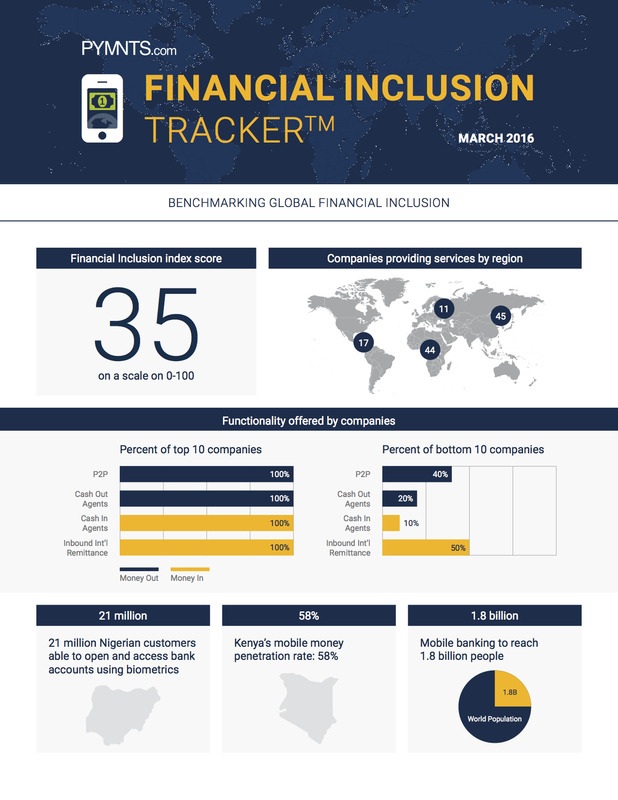 This issue of the PYMNTS Financial Inclusion TrackerTM suggests that demand for services outstrips the supply of those who are capable of delivering services to meet that demand. P2P is offered by 87% of providers demonstrating the importance of this key feature in mobile money offerings. – Four of the top 10 companies surveyed, exclusively offer their services in Africa. – Asia accounts for 32 percent of global mobile money accounts. – Kenya is the leader with the highest penetration reaching almost 60% of people above 15 years old. The PYMNTS.com Financial Inclusion TrackerTM, is designed provide governments, financial institutions, telecoms, retailers, and others interested in understanding the financial inclusion landscape, an organizing framework for evaluating the many players that provide digital financial inclusion services to underbanked and unbanked populations around the world.